Over at Heavy Medal, Nina already discussed some of what makes this a standout. The language is the obvious thing — it’s gorgeous. Sentence after sentence just flows perfectly. Wordplay, foreshadowing, the omniscient-but-not narrative voice (more on that below): I reveled in this. It’s a slow read — 475 pages, and on a nice heavy stock of paper to boot — but the kind of slow that can swallow a reader up and keep him or her enthralled the entire time. The plot is twisty and multi-leveled, with layers that can be read more deeply about childhood, poverty, governance of nations, the meaning of magic, and more, or all of that can be ignored for a long adventure that can still delight. There’s also an interesting play with some of the narrative quirks of great Russian fiction, although my own reading in that body of work isn’t very deep, so someone else might be able to comment on this more intelligently. What came across for me was some tonal callbacks in general, and the doctor in particular. 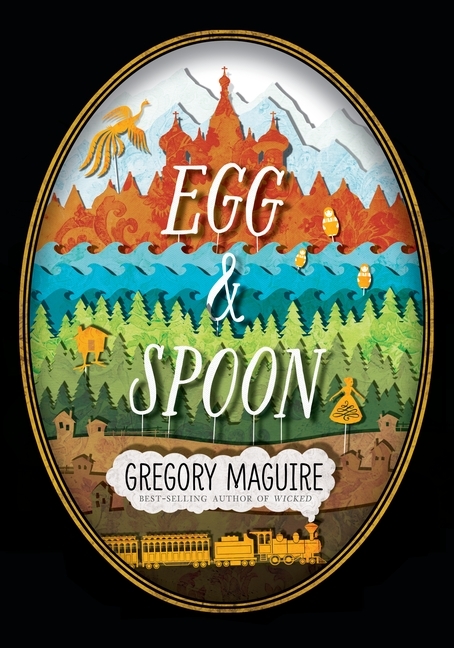 And of course there’s the use of nested fairy tales, just like the nesting dolls, and the tales within tales — such strong imagery throughout, all of it so neatly tied together in ways that seem organic to the tale and the telling but reveal themselves in retrospect. Now, I’ll admit that it flags a little in the end section — I love the adventures (the dolls and the soldiers — what a fantastic passage, in all senses), and there are some splendid little episodes woven together plus lots of Baba Yaga, a magnificent character. Her pathos and prickliness, her humor, the way she defies genre or textual limitations and ignores all the rules within her world and the reader’s world as well — yes. More like this, please. But the pacing is different from the earlier part of the novel, not always successfully, and the narrator has more to say and maybe goes a little saccharine at the end. I didn’t love that as a reader, but I don’t know that it’s not organic to the text and the story he’s been telling or the way he has sentimentalized his tale even as he claims he isn’t and we shouldn’t either. There is, of course, the age debate, which has shades of an appeal debate too. I was shocked that it was being considered MG. In a way, I am even surprised that it could be considered YA: this was very strong in the adult appeal category. And I do believe I have readers for it among my HS students, but then, I have readers for adult and children’s books as well (Murakami and The Edge Chronicles both circulate…), so having readers doesn’t really settle the question. Here’s why I thought it wasn’t middle grade: it’s too long and it is improved by greater knowledge of the larger world. Also, narrator seemed like the opposite of what might be desired or expected for a children’s (or YA) title. However, that arch narrative voice shades back to Lemony Snicket or, as was pointed out in the comments on the Heavy Medal post, Adam Gidwitz, and has proven appeal for younger readers, so maybe I am just being unfair to them in thinking this is too much. Perhaps this is a true all ages (where all = fluent readers): Nina makes a case for child readers, I genuinely believe I can hand this off to a number of teens I work with, and the adult reviewers (4 stars) have proven adult appeal as well, at least for adults who read across the youth market. I think too that the reader will age the girls according to their own age; I assumed they were 14 or 15 (Cat, after all, is traveling to meet a potential husband), but a colleague who works with younger readers assumed 11 or 12. Which makes this fairly versatile — no readership pigeonholing thanks to character ages. I’ve been thinking a lot about books I most want to talk to others about, and this is definitely one of those books. It’s strongly written, provocative, worth a second read, and a pleasure as well. I’d say that means it deserves some recognition from someone. So glad you liked this one. Me too! I did see it as very much MG, just for a smaller audience of that age group. I was thinking more ages 11/12 and up, but then a couple of my 4th graders asked for it. That surprised me — not sure where they even heard about it. I’ve had it on a bookshelf above my desk, but hadn’t recommended it to them, thinking them too young for it. So now I’m incredibly curious to see what they think of it. My guess is that they will read for what they like and ignore the parts that are a bit too philosophical for them. There are some really incredible sections that I think they will adore. I thought his rendering of Baba Yaga was brilliant. Also those scenes of the Winter Palace and festival. Amazing. I would have loved this as a kid, perhaps even when I was in 4th, certainly by 5th. And absolutely by high school where I was reading every sort of fantasy, fairy tale, literary fairy tale, etc. So while I do think adults will enjoy it, the sensibility still feels for the young, ages 10 and up. No doubt because of all the snow and ice I was at one point reminded of a favorite childhood book of mine, Swede Selma Lagerlöf’s The Wonderful Adventures of Nils.